Body size is small to medium (68-76 cm height and 30-43 kg weight); broad face with straight profile; thick horns; predominantly reddish-brown colour; beards and ruff occur in 82 and 99% of the males, respectively (FARM-Africa, 1996). Widely distributed in the central highlands of Ethiopia west of the Rift Valley escarpments, in the highlands of central Tigray, Wollo, Gondar and Shoa; maintained by settled agricultural ethnic groups (the Amhara and Tigray); its distribution also extends into adjacent areas of southern Eritrea; the climate is highland subhumid and semi-arid; the production system is mixed smallholder farming (FARM-Africa, 1996). 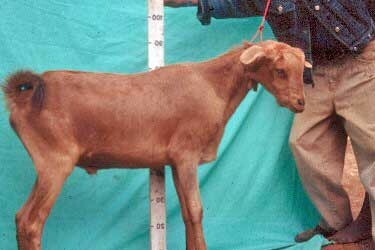 Probably derived out of interbreeding of earlier goat types in the past (FARM-Africa, 1996).